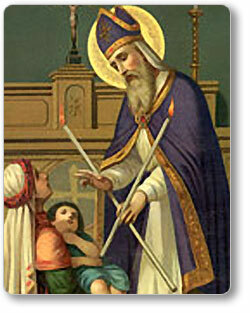 Little is known about Saint Blaise prior to his mention in a court physician’s medical journal. The physician, Aëtius Amidenus, spoke of Saint Blaise’s aid in treating objects caught in the throat. He was also mentioned in the book of Acts, where he was aided by animals and treated people and beasts alike. In 316, the governor of Cappadocia and of Lesser Armenia, Agricola, arrested then-bishop Blaise for being a Christian. On their way to the jail, a woman sent her only son, who was chocking to death on a fish bone, at his feet. There is a Saint Blaise’s Well in Kent, and the water is believed to have medicinal properties. A Blessing of the Throats ceremony is held every February 3 at Saint Etheldreda’s Church in London and Balve, Germany. We had the Blessings of Throats at Mass this morning.